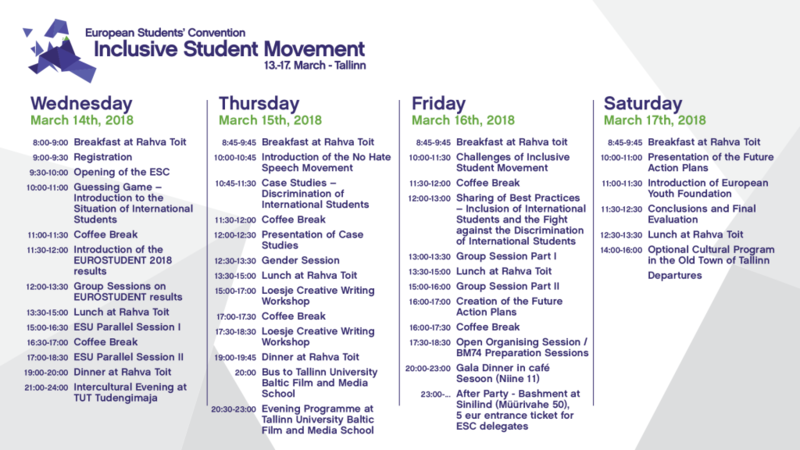 The 35th European Students’ Convention by European Students’ Union (ESU), will take place from 13 to 17 March 2018 in Tallin, Estonia. The convention will be focused on “Inclusive student movement” and concentrates on the safety and well-being of international students in the society and their inclusion in the student movement. For more information, please feel free to check the Event Reader. If you have any doubts, do not hesitate to contact Renate: renate.gross@eyl.ee.